BT (NYSE:BT) and Dolby Laboratories, Inc. (NYSE:DLB) today announced the latest updates to BT ® MeetMe with Dolby ® Voice™ , an audio conferencing service that makes conference calls sound and feel like in-person meetings. BT MeetMe with Dolby Voice combines Dolby’s nearly 50 years of expertise in core signal processing and human psychoacoustic perception with BT’s world-class communications capabilities to improve the way people communicate at work, enhance business productivity, and reduce the cost of conferencing. BT is announcing the availability of the BT MeetMe with Dolby Voice mobile app for both the iPhone ® and Android™ platforms. The app provides workers a superior conference call experience from a mobile device and a simple, cost-effective way for businesses to support workers who connect to calls remotely. The app makes meetings easy to start and join: conference participants simply tap in from the mobile app. There’s no need to find the phone number or to compromise when communicating from a mobile phone. “The BT MeetMe with Dolby Voice mobile app strengthens our audio conferencing proposition and reinforces the key advantages our product offers in the marketplace. BT MeetMe with Dolby Voice offers what we believe to be the best mobile experience and makes it more cost-effective for organizations to support mobile workers,” said Howard Dickel, CEO, BT Conferencing. “Later in the year, we will be launching the BT MeetMe Dolby Voice Conference Phone, which will complete our lineup, providing our customers with the best audio conferencing experience at any time, anywhere,” Dickel added. BT MeetMe with Dolby Voice makes conference call participants feel as if they are in the same room, enabling them to focus on the content of the conversation, without the limitations of standard conference call technology. Decisions are made, innovation increases, and distributed teams collaborate more effectively. To explore the gap between in-person meetings and conference calls, Dolby conducted a series of experiments to compare how well workers performed specially designed and highly interactive tasks when working together in person as opposed to performing the same tasks using only a conference call. The research showed in-person meetings to be the most effective. In a comparison of conference call solutions, however, workers who used the high-quality Dolby Voice spatial-audio system were almost 60 percent more efficient than workers who used a conventional conferencing system. In a recent Dolby Lab Notes blog post, Dr. Mike Hollier, CTO of Dolby’s Communications division and an expert in auditory science and engineering, notes that conventional conference calls are exhausting because they require people to apply most of their conscious intelligence to analyzing and deciphering audio information rather than the content of a meeting. “BT MeetMe with Dolby Voice improves the way people communicate by harnessing the collective IQ of all workers on a conference call—and can help make businesses smarter, too,” said Hollier. Several companies have selected BT MeetMe with Dolby Voice service based on its ability to improve productivity, enhance collaboration, and improve operations. Early results indicate that customers typically save 25 percent to 50 percent off their total conferencing bill when using BT MeetMe with Dolby Voice. 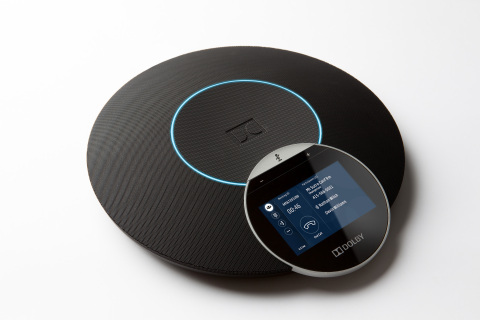 Dolby Voice lowers network transport and connectivity costs, allowing meeting participants to gain access over any IP network rather than using more expensive dial-in numbers. Dolby Voice eliminates the need for companies to choose between quality, convenience, and cost. BT is one of the world’s leading providers of communications services and solutions, serving customers in more than 170 countries. Its principal activities include the provision of networked IT services globally; local, national, and international telecommunications services to its customers for use at home, at work, and on the move; broadband, TV, and Internet products and services; and converged fixed/mobile products and services. BT consists principally of five lines of business: BT Global Services, BT Business, BT Consumer, BT Wholesale, and Openreach. For the year ended March 31, 2013, BT Group’s reported revenue was £18,103m with reported profit before taxation of £2,315m. Dolby Laboratories (NYSE: DLB) creates audio, video, and voice technologies that transform entertainment and communications in mobile devices, at the cinema, at home, and at work. For nearly 50 years, sight and sound experiences have become more vibrant, clear, and meaningful in Dolby. For more information, please visit www.dolby.com.